The BET Honors is held every year at the Warner Theatre in Washington, DC. The purpose of the BET Honors is to recognize extraordinary African-American achievement and accomplishment. Among the many celebrities walking the BET Red Carpet were: Halle Berry, Alicia Keys, Kelly Rowland, Cedric the Entertainer, and Gabrielle Union. The Hip-Hop Summit Action Network (HSAN), an organization created by Russell Simmons, held an Inaugural Ball in honor of the re-election of President Barack Obama. The event was held at the Sidney Harman Center and was attended by celebrities which included John Legend, Eva Longoria, Wayne Brady, Swizz Beatz, Alicia Keys, Rosario Dawson, and many more. The BET Hip-Hop Awards took place in Atlanta, Georgia at the Atlanta Civic Center. This is annually the most important event for the Hip-Hop industry. 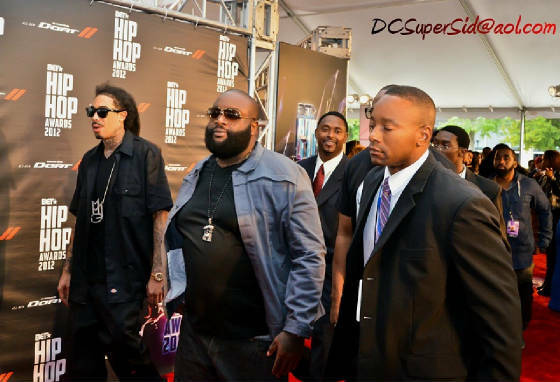 Rap royalty in attendance were: Rick Ross, Wiz Khalifa, 50 Cent, P. Diddy, Joe Buddens, DJ Drama, Meek Mill, and Wale.